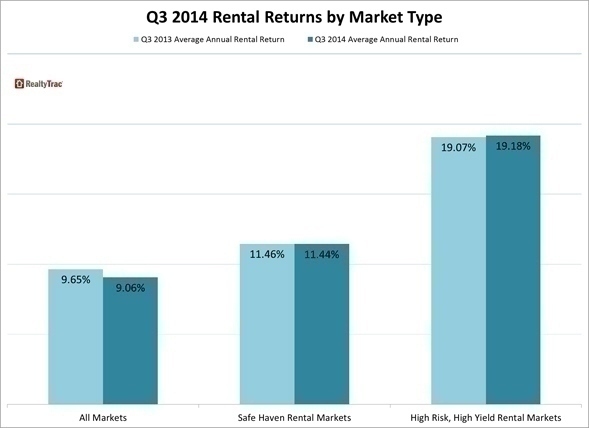 RealtyTrac® recently released its Q3 2014 Residential Property Rental Report, which ranks the best markets for buying residential rental properties. For the report, RealtyTrac analyzed median sales prices for residential properties and average fair market rents for three bedroom properties in 586 U.S. counties with a combined population of 218 million people — 71 percent of the total U.S. population. Rental returns were calculated using annual gross rental yields: the average fair market rent of three-bedroom homes in each county, annualized, and divided by the median sales price of residential properties in the third quarter. 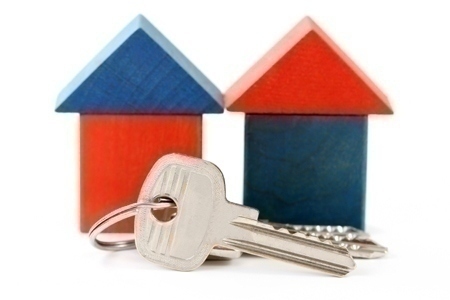 The 586-county analysis found that investors buying U.S. residential rental property in the third quarter of 2014 are getting an average annual return of 9.06 percent, down from an average annual return of 9.65 percent for the third quarter of 2013. Median home prices in the 586 counties analyzed in the report increased more than 7 percent on average in the third quarter of 2014 compared to a year ago, while average fair market rents for three-bedroom homes increased an average of less than 1 percent. In these counties on average 33 percent of the housing units were renter-occupied and 67 percent were owner-occupied. The average rental vacancy rates in these counties were 7.4 percent compared to a national average of 8.7 percent as of the end of 2012. “The single family rental market is still strong, with returns averaging 9 percent in the 586 counties analyzed,” says Daren Blomquist, vice president at RealtyTrac. “Even so, the market is softening, with those same 586 counties averaging a nearly 10 percent return a year ago. Top 10 markets for rental returns-Edgecombe County, N.C., in the Rocky Mount metro area had the highest annual gross rental yield among the 586 counties analyzed, 41.57 percent, followed by Clayton County, Ga., in the Atlanta metro area (26.88 percent annual gross rental yield), Duplin County, N.C., (24.40 percent annual gross rental yield), Howard County, Ind., in the Kokomo metro area (24.00 percent), and Putnam County, Fla., in the Palatka metro area. The remainder of the top 10 markets included three other Florida counties (Columbia, Pasco and Hernando) along with another Atlanta-area county (Spalding) and Wayne County, Mich., in the Detroit metro area. 10 markets with lowest rental returns-New York County, N.Y. (Manhattan) ranked lowest among the 586 counties with an annual gross rental yield of 2.40 percent, followed by San Francisco County (3.16 percent annual gross rental yield), Kings County, N.Y. (Brooklyn, 3.64 percent), Williamson County, Tenn., in the Nashville metro area (3.73 percent), and Marin County, Calif., also in the San Francisco metro area (3.75 percent). The remainder of the bottom 10 markets for annual gross rental yield included three other Northern California counties (Santa Clara, San Mateo and Santa Cruz), along with Westchester County in the New York City metro area and Eagle County, Colo., in the Edwards metro area. To view more information about the report, click here.